Up until now communicating with swimmers whilst they are swimming has been impossible. With the help of bone conduction technology Aquatalk™ this problem is solved. 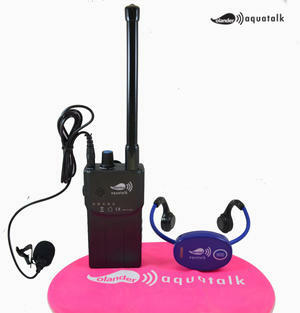 By using Olander Aquatalk™ the coach can to talk with swimmers in real time. Coaches can give instant feedback to the swimmers when they need it. Improve technique, stroke rate, pacing in all strokes. These systems run on 7 different frequencies enabling multiple coaches to talk to swimmers in lanes in even busy pools. The range is about 75 metres and the battery life for transmitter and headsets is 2 hours plus. I am the exclusive UK agent for Olander Aquatalk systems.